What Is The Berg Timer . . . The BT is declared by the trees, the birds, the flowers and breeze. It's the sunlight smiling at the eagle in the sky. All Nature it is but that's not all. It's the clock of a planet's journey and a volcano's fury. a gift of the heavens. Devoted to helping you in your weather awareness and all things affected by the weather, which is just about everything! 11/14 --- Massive, deadly, historic California fires a part of the long ago forecasted drought for the 2020's. Droughts typically creep up on you over several years. Then all of a sudden it's a major drought like the dustbowl 1930's. See current U.S. Drought Chart. 11/20 --- BT profile for N. California peaks this Fri/Sat Nov. 23-24, correctly forecasting the 1-7 inch total precip expected for that area. Good job BT. 11/26 --- The profile for Travel Delays peaked on day -4 which was on Sunday, November 25. Here a quote from ABC News: "Travelers going in and out of some Midwestern cities this Sunday are experiencing flight delays and cancellations on one of the busiest travel days of the year, with 15 states under a weather alert due to winter storm and blizzard warnings.". Also, the United States Precipitation profile peaks on day -4. Those two profiles together screamed "don't travel now". Thousands could have avoided that delay by taking just five minutes to check here before planning their travel dates. 12/2 --- Getting close to finishing ocean study. As one might expect, it's complicated. But it's also very simple. Briefly, the BT cycle (the "eagle" formation) shows up everywhere. The only places where ocean height doesn't cycle with BT are the coastal areas where the five major currents of the world (N & S Atlantic, N & S Pacific, Indian ocean currents) hit the continents Charts to come. 12/10 --- BT correctly forecasts this major winter storm causing widespread airline delays. See Airline Delays profile details here which peaked twice on the day of Sunday's blizzard, a very rare BT event. As reported by USA Today, "American Airlines said it has proactively canceled 1,100 Sunday flights because of the storm. That is on top of 225 cancellations on Saturday. The cancellations are now expected to spill into Monday, with American saying late Saturday that 300 Monday flights have been canceled." Power outages to over 160,000 in the Carolinas. 12/11 --- I reported long ago how BT can forecast Mars wind speed and Moonquakes. Now I've found correlations to Mercury's Dew Point and H20 Partial Pressure. Charts soon. I've got my hands full of so much good research. Like I've always said, researching the Berg Timer is like having a tiger by the tail. 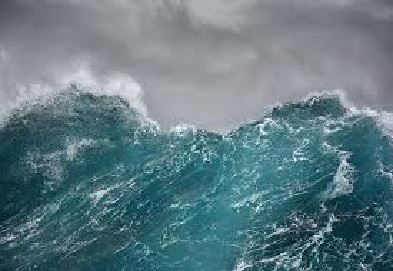 12/13 --- Finding that the oceans rise and fall in a 25-day rhythm according to the Berg Timer. There are lots of studies finding a 50-day rhythm which might simply be an extension of a 25-day rhythm (D. Djurovic, P. Paquet 1991 Royal Meteorological Society and The "Madden and Julian Oscillation" 1971 widely referenced). However a 25-day rhythm has been found (Bizouaid and L. Seoane Atmospheric and Oceanic Forcing 2009). Looks like climate modelers have found the BT rhythm by going in the back door but they still don't know the 'why' or when these cycles are going to appear. The cause and the 'when' is planetary positions, a.k.a. the Berg Timer. 12/25 --- U.S. precipitation map charts now available, historical and forecasts. See here. 1/11 --- I have several things still on the burner. Ocean study including height/temperature/speed/direction correlations. Atmospheric angular momentum. Also the Planet Mercury's dew point . . . good to know if we need to equip a Lander with windshield wipers, seriously. 1/23 --- The BT Precipitation forecast maps are doing very well. The forecast map and travel delay info is published there now for the Super Bowl. 2/16 --- I'm calculating BT back to year 1000 to confirm a newly discovered BT/long term temperature correlation. Very exciting! 2/22 --- BT from year 300 published today. Highest two BT peaks at beginning of Medeival Warm Period and Modern Warm Period. Link directly below to download yearly Berg Timer values from 300 to 2200 AD (Excel file). 3/2 --- Monthly Berg Timer values from 1900 to 2050 link below. Monthly BT on this website proven to be a good indicator for commodities, arctic ice, world cloudiness, temperature and wind speed, homocides, earthquakes, volcanoes, ozone, and monsoon. 3/17 --- Went over the whole website today and updated some of the charts if data available and also checked out some links and improved them if possible if the old one was inactive. Yearly U.S. temperature was updated. 4/5 --- Precipitation Forecast Maps now available through to April 30. 4/13 --- The daily Berg Timer numbers through July 2019 are now available on the Forecasting Page. Also available there are the Profile Numbers to find out the probable airline travel delay days for your Spring-Summer travel. It really works! 4/16 --- Introducing MONTHLY Berg Timer Profiles! The first long term studies using monthly profiles has been finished on Global Sea Ice Extents. 'sea' below. It confirms the 1700 year temperature study shown directly below. 4/20 --- Discovery! Neutrons a major factor in cloud nucleation. See in Sequence. The points of high Berg Timer mark significant lows in temperature. The two strongest BT years of 949 and 1982 are major temperature lows, 949 being the beginning of the Medieval Warming Period and 1982 the beginning of the Modern Warming Period. April 15 and 16 of 1982 together total a BT strength of "31", the highest two-day period of the 1700 years. The number of hurricanes, like temperature, bottomed in 1982. In July of 1982, major solar flares caused what is termed 'an unusual' and 'interesting' solar-terrestrial event. It's detailed in the paper, "Structure of the July 1982 Event In Relation To the Magnetosphere's Response", published here at harvard.edu. The 1982 BT also coincided with the strongest El Nino event in recorded history. Just what happened on April 14-15 of 1982? In those two days the planets were in a position never seen before in at least the last 1700 years. Is it a coincidence that it marked the time of the greatest El Nino in recorded history? Or the lowest number of hurricanes in 64 years? Or the beginning of the Modern Warming Period? It's not a coincidence. These things were caused by the symmetry of planetary positions as recorded by the Berg Timer. Solar activity, weather, the oceans . . . Earth responds to planetary symmetries like this and to all those of smaller degree as documented throughout this website. Below is the configuration of this historic planetary alignment, the strongest example yet of the Berg Timer's effect on our environment. What Symmetry! Quite the " " formation. There are a couple theories out there to describe what's going on here to explain why the Berg Timer works. The best I think is the electromagnetic one, equating the solar system to a generator. It's probably new physics. Or maybe take away Pluto and you have Grand dad's old V-8 motor. All planets except Mercury were within 67 degrees of each other. Earth and Pluto were conjunct, in the same degree of longitude with respect to the Sun. So Earth and Pluto were equal degrees away from the other 7 planets. Mars and Saturn were also conjunct three days later. Mercury was equidistant from two or more planets fourteen times during its 10 degree movement from April 14 to 15.
" . . . the similarity between an electric generator with its carefully placed magnets and the sun with its ever-changing planets is intriguing. In the generator, the magnets are fixed and produce a constant electrical current. If we consider that the planets are magnets and the sun is the armature, we have a considerable similarity to the generator. However, in this case, the magnets are moving. For this reason, the electrical-magnetic stability of the solar system varies widely. This is what one would expect." This analysis of BT is simple and persuasive and lends support for BT's global, universal effect. I've already correlated BT to Mars wind speed and Moonquakes. The yearly Berg Timer is relatively active in 2020. Temperature should make an important low then, an indication of the major drought expected in the 2020's, an event forecasted here long ago. That forecast is shown at the bottom of this page. temperature chart source: NOAA Climate.gov graph by Fiona Martin, adapted from Figure 34.5 in the National Climate Assessment, based on data from Mann et al., 2008.
hurricane chart source: Community Preparedness website. What is the Berg Timer? What is a Berg Timer Profile? cause solar activity to affect Earth's weather. which is just about everything. My aim is to say that the machinery of the heavens is not like a divine animal but like a clock and that in it almost all the variety of motions is from one very simple magnetic force acting on bodies, as in the clock all motions are from a very simple weight. 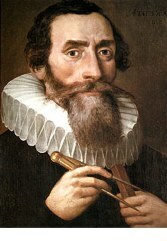 Johannes Kepler, Letter to J.G. 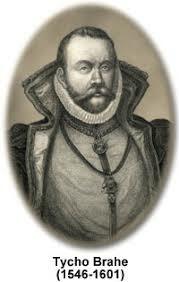 Herwart von Hohenburg, 16 February 1605. 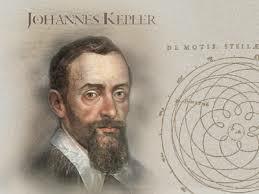 Kepler, astrologer and astronomer, worked from the carefully measured positions of the planets recorded by Tycho Brahe to mathematically deduce his three laws of planetary motion, enabling Isaac Newton to devise the law of gravitation. The relationships set forth here imply that certain dynamic forces exerted on the sun by the motions of the planets are the cause of the sunspot activity. Paul D. Jose, Aerospace Research, USAF. The Astronomical Journal, Vol. 70. April 1965. It is found empirically that solar activity is preceded by planetary conjunctions. A long-range prediction technique has been in use for 2.5 years, which predicts flares and proton events months in advance. J.B. Blizard, Denver University. American Physical Society Bulletin #13, June 1968. In summation, after more than 25 years of research in this field of solar system science, I can say without equivocation that there is very strong evidence that the planets, when in certain predictable arrangements, do cause changes to take place in those solar radiations that control our ionosphere. John H. Nelson, RCA Communications. Cosmic Patterns. 1974. The words above were spoken or published by religious teachings and respected science journals and authors. Their work has been personified by the creation of the Berg Timer in 1980. This body of work represents the bringing together of the wisdom of the ancient astrologers and the accuracy of today's astronomer to demonstrate that all of the universe's physical and biological paths are inextricably and importantly linked to the planets. From the ancient Aztec and Maya civilizations, the 13th Century's Ptolemy and Dante, and the Renaissance's Galileo, Kepler, and Brahe who overturned the old astrological order, to today's so technologically accurate astronomers. All share the common goals of truth and the value of scientific understanding. The same thing is to be understood of all bodies, revolved in any orbits. They all endeavour to recede from the centres of their orbits, and were it not for the opposition of a contrary force which restrains them to and detains them in their orbits, which I therefore call Centripetal, would fly off in right lines with a uniform motion. 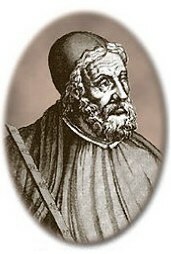 Ptolemy's Almagest was an authoritative text on astronomy for more than a thousand years, and the Tetrabiblos, its companion volume, was influential in the study of the effects of astronomical cycles on earthly matters. 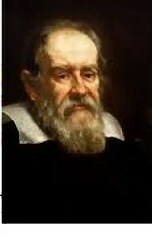 Galileo was one of the first modern thinkers to clearly state that the laws of nature are mathematical. The radius vector describes equal areas in equal times. The roads by which men arrive at their insights into celestial matters seem to me almost as worthy of wonder as those matters in themselves. developer of the theory of relativity, one of the two pillars of modern physics (alongside quantum mechanics). 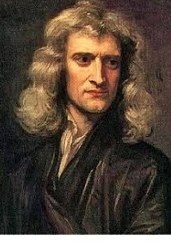 More Isaac Newton quotes . . . The same law takes place in a system, consisting of many bodies, as in one single body, with regard to their persevering in their state of motion or of rest. For the progressive motion, whether of one single body or of a whole system of bodies, is always to be estimated from the motion of the center of gravity. If the experiments which I urge be defective, it cannot be difficult to show the defects; but if valid, then by proving the theory, they must render all objections invalid. It is indeed a matter of great difficulty to discover, and effectually to distinguish, the true motions of particular bodies from the apparent because the parts of that immovable space, in which those motions are performed, do by no means come under the observation of our senses. More Albert Einstein quotes . . . The early scientists, Ptolemy-Galileo-Kepler were all, at their roots, astrologers. They all knew and understood that their environment was affected by the heavens. And they were astronomers. They knew that detail and strict rules of analysis and logic brought their theories home with facts. Their work ushered in, and laid the basis for, the science of astronomy. Hi, my name is Larry Berg. Astrologer and astronomer, I am self funded and self taught in astrophysics, solar physics, meteorology, and the planetary sciences. I've created an indicator capable of forecasting most all things related to the cycles of the sun, the planets, the weather and oceans. Now in my mid-60's, my life's work is finding its fruition. The newly developed BT profiles are simplifying everything and objectively proving that the capability now exists to forecast not only solar activity but the effects it has on our weather and many other environmentally sensitive aspects of our lives. With today's precise astronomical calculations, satellite and ground data, and application is formed one simple, yet all-encompassing forecasting tool, The Berg Timer™. BT was discovered on November 19, 1980. Its applications on this website are the result of over 40 years, and tens of thousands of hours of concentration, labor, sacrifice, data acquisition, analysis, frustration and discovery. It could not have been completed without the scientists, engineers, and researchers in all fields of study who are part of a vast network of technology and who make their data available for research. Ever since I turned over my first rock as a child I've been fascinated by Nature. My passion has been the study of natural cycles, specifically, the relationship between planetary cycles, solar cycles, and the cycles of Earth's weather, biosphere, geology, and even human behavior. It's to everyone's benefit to have a good understanding of the future. Whether it's weather, sales, politics, science, health services, the markets . . . everyone is dependent upon, and subject to, future circumstances. Knowing more about these natural cycles and being able to predict the future enables us to decrease the probability of allowing things to happen by chance and, thus, have more control over our lives and business. I created and developed this simple indicator which can forecast many things, very reliably. Farmers and traders now know when the next drought will occur and when it'll be rainy and cool. Emergency services now know when accidents are most likely to occur. Power companies know when to expect geomagnetic storms. Business owners can forecast sales strength. Stock market investors know when to buy and sell. Now we all know when we'll have the best weather to schedule outdoor activities and travel. The Berg Timer can forecast most anything you want to know that's related to weather, which is just about everything. BT's applications are so broad that any institution, business, or individual can benefit by applying it to their activities. Since BT is based on planetary positions, and future planetary positions can be projected with precise accuracy, BT can make its forecasts for all indices infinitely into the future with no loss in reliability. Welcome. Join me as I turn over some more rocks. What Makes the Berg Timer Values? There are three way a Berg Timer point can be made. First is when two planets are longitudinally equidistant from a third planet, making one BT point. Second is a pretty rare event when two pairs of planets each share the same distance apart. This is shown below when Mercury/Venus and Mars/Earth were both 43 degrees apart, another BT point. 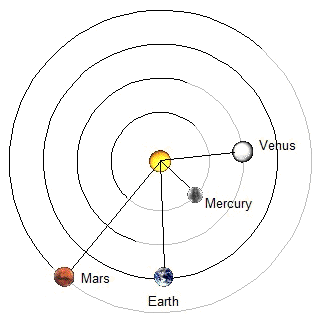 Third is when two planets are in the same degree of longitude, thus being the same distance away from all the other 7 planets, automatically making 7 BT points. On June 23 Mercury was exactly at the midpoint of two other planets. Mercury was 47 degrees from both Venus and Earth. One BT point. On June 25 Mercury was 43 degrees from Venus and Earth was also 43 degrees from Mars. Two separate pairs of planets an equal distance away. One point. Not shown is the third way a BT point can be made. If two planets are in the same degree, they are each then automatically the same distance away from the seven other planets, making 7 BT points. Then the points are simply added together for whatever time series desired. I typically use daily, monthly, and yearly BT in the correlation studies. The history and development of the Berg Timer can be read in the site page http://www.justgoodtiming.com/id48.htm. Essentially it began with an interest and understanding of astrology way back in my 20's. My understanding of astrology was so thorough that I could often guess someone's sign just by observation. So I knew that there must be something to it and that a larger application for it in the world must exist. That led me along the long road of discovery. There's really nothing like the feeling of discovering something no one has ever known before, especially since it might be a new law of physics. How the planets' positions can affect solar activity is not known. I'm not a physicist but I've done a lot of reading over the last 40 years. My best guess is that its an effect of the planets' position on the interplanetary magnetic field. We will need space buoys throughout the solar system in order to measure its macro changes. That day will come. In my early days in the 70's, with no computers, I drew out all the planetary cycle lines by hand. It took me about two days to do one year. Now with the computer I can do it in about seven seconds. So I now have a library of BT from the years 300 to 2300. Sometimes you can look at a chart comparison between the Berg Timer and solar flares, for instance, and quickly see how they most often occur just before and after strong BT. Some see it, some don't. So in order to have an objective answer to that question I developed the Berg Timer Profile which shows exactly how something correlates with BT over a certain length of time. 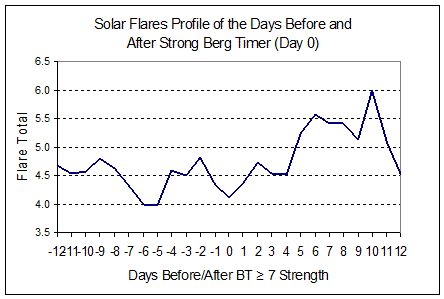 A BT profile is a daily line graph showing how often an indice, like flares, occurred from 12 days before to 12 days after when the Berg Timer was >= 7 strength or higher. To make the profile I developed a spreadsheet in which I input the daily values of the indice I want to correlate with BT. Then it shows a charted profile of what the indice was doing on each of 12 days before and after BT >=7 strength. Right now I correlate 12 years of data from 2006 to 2017 to get the 12-year profile of an indice's past behavior and, thus, expected future behavior. There were 256 instances of BT being >=7 during those 12 years. So the the daily behavior of an indice over those twelve years in 256 instances times 25 days = 6,400 behavior data points of the indice. A 2006-2016 profile of the indice is made, and also a 2017 profile. If the year 2017 profile compares accurately with the 2006-16 profile, then you know that BT can accurately forecast that indice. You then know that the indice's historical behavior with respect to the Berg Timer can reliably forecast the future of that indice using BT. Using profiles makes the analysis of an indice objective and provides empirical proof, or disproof, for a BT correlation. 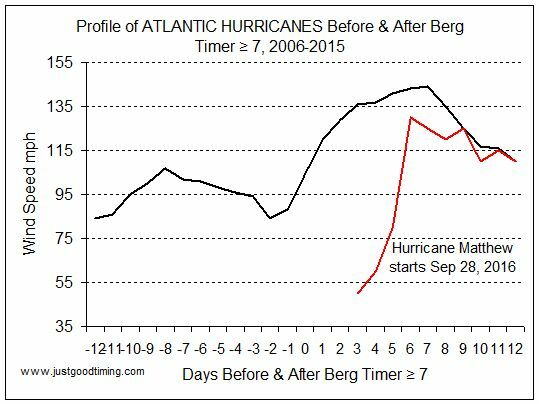 One can look at a charted comparison of BT and hurricanes for instance and see that hurricanes are most likely to develop just after a BT "7" day. Its profile provides an objective confirmation of that. Also, since BT "7 or more" days sometimes occur within 12 days of each other, the profile automatically integrates multiple BT days' effect which the eye cannot do. Profiles don't always show a definite correlation. Some just wiggle up and down sideways and are not consistent over the years. In these cases the profile can't be of any practical value. Usually there's a third factor which is overriding the data. That necessitates an adjustment. For instance, when comparing BT to car accidents you have to remove the tendency for higher accidents to occur on holidays and weekends before the data can be compared. The "sequence" charts below, due to similarities impossible by chance and which are consistent with scientific research, prove that the Berg Timer is a significant, if not major, cause of changes in solar activity. Thus so for other indices related to solar activity like Cosmic Rays, Solar Irradiance, Atmospheric Angular Momentum, Precipitation, Temperature, and Tornadoes. Not yet published is proof of BT's correlation to Global Sea Ice Extent and Mercury's atmospheric indices. 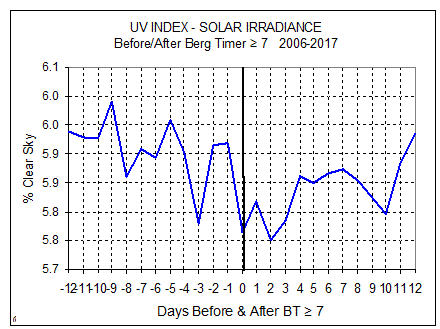 The sequence of BT's effect from the sun to the Earth's surface involves a number of indices which have been well measured by today's satellite and surface instruments. It involves several areas of professional understanding of which I have made a good effort to learn. What we all want to do is to understand the mechanics of the transmission of solar activity through the Earth's atmosphere to the ground. Solar activity's effect on Earth rotation via atmospheric, oceanic, and hydrological angular momentum and polar motion is also being studied. This evidence proves that the Berg Timer is able to forecast all of these indices involved, which essentially means that the Berg Timer is causally connected to the sequence of the Sun/Earth effect. One cannot artificially reproduce such an occurrence. The following sequence begins with the Sun's correlation to the Berg Timer. Each subsequent indicator is then presented in a logical and scientifically consistent correlation to the Berg Timer. Its goal is to prove that BT is not only causally connected to the first effect, the sun, but also to all further effects of the sun. Not only that, but evidence is or will be soon presented elsewhere on this website demonstrating BT's effect on the moon's, Mars', and Mercury's atmospheric and geological indices. The Berg Timer's effect on the solar system's sun and revolving bodies is new astro, solar, planetary, and atmospheric physics. Its discovery will revolutionize current scientific thinking and create an exciting search for the reason why BT works. I welcome feedback as to some of the conclusions I've made but I've tried to follow today's thinking of the specialists and have taken great pains to use the most complete data in each field of study. So it goes, from the Berg Timer to solar physics, to radiation, to magnetic fields, to Earth rotation rate, to atmospheric science, to meteorology, to oceanography, to geophysics, to geology, to the biosphere, to all of us, to the other planets, everything. It's been a lot of hard work. In 1932 Harper's Monthly published a quote from Albert Einstein to the effect saying that research boils down to 1% inspiration and 99% perspiration. So true. What a wonderfully symmetrical profile! the first cause appropriately flying like an eagle. The Sun-Earth effect begins here. Solar flares often coincide with sunspots. Flares bottom with sunspots at day "0" when BT >= 7. The physics of the planetary positions' effect is not known. I believe it to be an effect of the planetary positions, as represented by the Berg Timer, on the solar system's interplanetary magnetic field. What a big surge of activity after '0' day! Solar flux is radio emission from the sun. It originates high in the sun's chromosphere. It bottoms exactly at the eagle's beak when solar activity is lowest. "The solar radio flux at 10.7 cm is an excellent indicator of solar activity. It is one of the longest running records of solar activity . . . it correlates well with the sunspot number as well as a number of UltraViolet (UV), ozone, and solar irradiance emissions that impact the (Earth) ionosphere and stratosphere." From link below. Solar irradiance is one of the most fundamental drivers of Earth weather and long-term climate. Satellites provide the most accurate solar irradiance data. 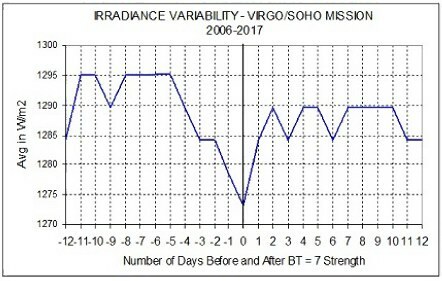 This data is from the VIRGO/SOHO mission and the Physical-Meteorological Observatory Davos/World Radiation Center. Again, exactly 'at the beak'. This chart shows total sunshine received at ground level. At day '0' to day '2' sky is least clear. Clouds are blocking the sun's radiation. So not only is there less sunshine then (4 above) but there is also more cloud cover generated by the ionized atmosphere. More on Irradiance at the links below. 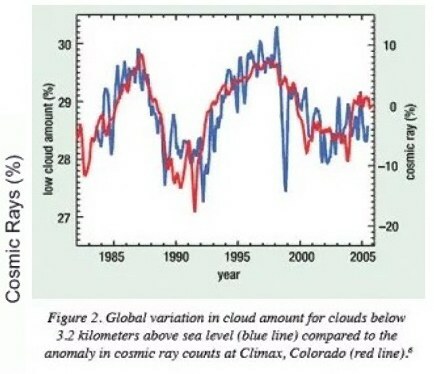 The chart above is evidence supporting correlation between cosmic rays and clouding. This is the most important step in The Sequence. The catalyst of the Sun-Earth effect. Low solar activity decreases the strength of Earth's magnetic field. This lets in more than usual cosmic rays from outside our solar system. Cosmic rays ionize protons, neutrons, and electrons when they slam into atmospheric particles. Research, although controversial, has found that water vapor attaches itself to these ionized protons and electrons which eventually form clouds. To the left are profiles for the three proton energies and electrons. 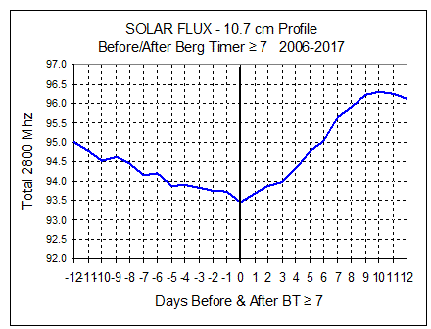 The protons bottom at day '1' right after day '0' which is the period of lowest solar activity as shown in the Sunspots profile in No.1 above. Electrons show only a little more strength but not much more around day '0'. Neutrons show an amazingly high strength around day '0'. So it's highly likely that Neutrons are probably a more active and so probably more successful nucleating agent leading to cloud formation. Most literature in this area of study focuses on protons and electrons as the cosmic rays particles likely to nucleate with water vapor. I would like to receive info if you know of any work on neutrons. Thanks. So, strong BT = high Neutrons = high cloud production. click on the DPD files. The AAM indice is defined as the ratio of East-West vs. North-South winds on Earth. The atmosphere accounts for 80-90% of the total angular momentum of Earth. The oceans and solid body of Earth account for the other 10-20%. This is a very strong profile, peaking at 'the Eagle's beak'. The article below describes what scientists call the 30-60 day "flip-flop oscillation" of our equator to pole atmospheric circulation as "not well understood" and that "the mechanism is unknown". The Berg Timer is the "the unknown". 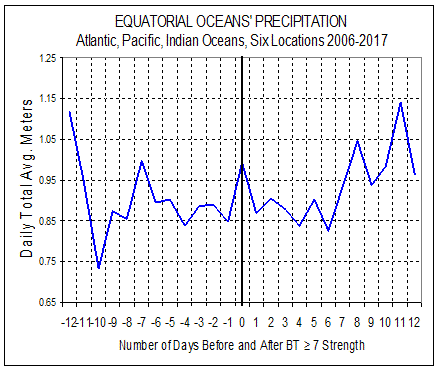 Ocean and coasts' weather have higher precipitation when BT is strong. So, this 'peaks at the beak'. The profiles are quite striking in their proportional structure and all world locations' similarity. These things aren't occurring by chance. 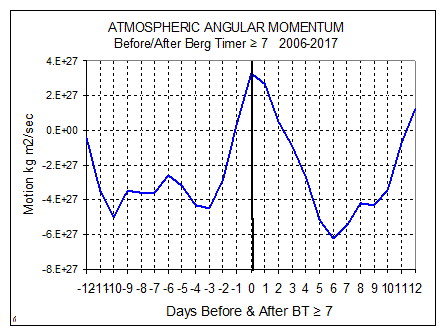 Strong Berg Timer = low solar activity = high cosmic ray particles entering Earth's atmosphere = high cloud formation = high ocean precipitation. Ocean precipitation peaks at "0" with the Eagle's wings widespread. Ocean and land precipitation are opposite. See No.10 next. 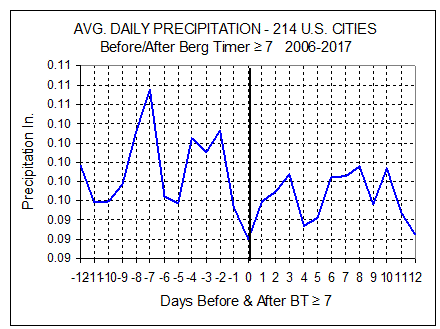 The low of 214 U.S. cities' precipitation occurs exactly at day '0' when BT is strongest. Land precipitation occurs inversely to ocean precipitation shown in No. 's 8 and 9 above. 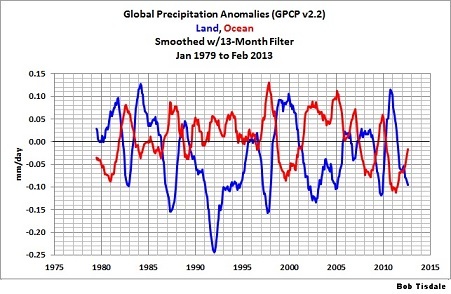 This is confirmed by the Land/Ocean chart (left) showing long-term Land and Ocean precipitation moving oppositely. Data source for the chart is NOAA's Global Precipitation Climatology Project. Being able to forecast rain is one of the first and most valuable discoveries my work has produced. I remember in the early 1980's, in my 30's in Omaha Nebraska, watching the rain come and go with the Berg Timer. It was then that I knew it worked with the weather. Omaha is great for weather watching. It gets most all the fronts that move out of the Rockies and up from the Gulf. 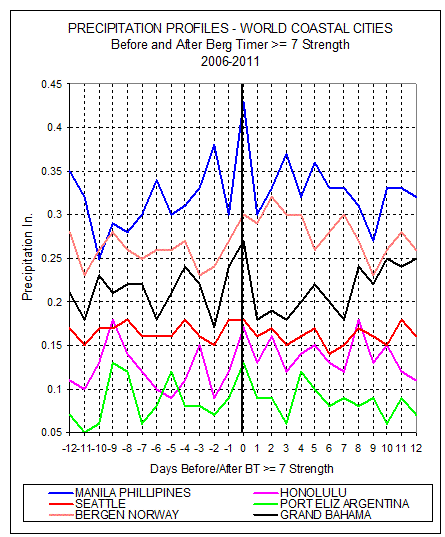 The U.S. Precipitation profile data source, Frontier weather, prides itself on the accuracy and completeness of its data. These are the first Monthly BT Profiles ever produced! It's exciting to move up to longer-term BT profiles, giving us a new perspective on world weather. The Berg Timer is able to forecast the long term up's and down's of sea ice because it's so good at forecasting short-term weather systems. 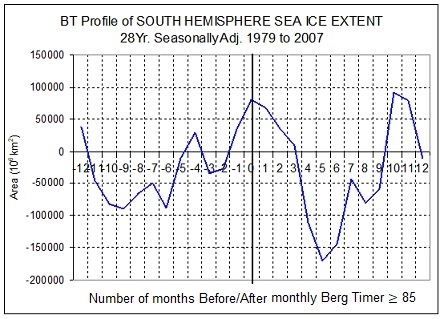 This 28 year study found that both hemispheres' sea ice peaks within a month of strong monthly BT, with trends lasting up to a year. This is consistent with the 1700 year study on the webpage above which found that strong BT correlates with temperature lows. 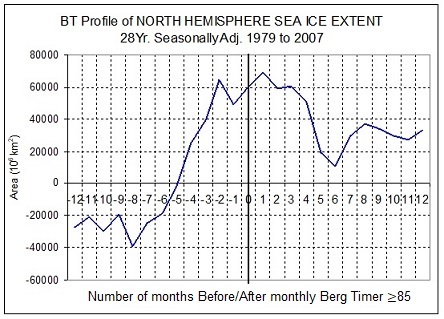 Since we've found that long term sea ice peaks and temperatures are low when BT is strong. We'll can go on to create the profiles for monthly cosmic rays, solar activity, and global precipitation. Won't it be fun to confirm all of the daily Sequence indices with monthly time frame profiles! Tornadoes are most often the result of strong low pressure fronts that move out of the Rocky Mountains into middle America, pulling up warm air from the south which combines with the cool northern air to form strong updrafting tornadoes in the area known as 'tornado alley'. The twister profile 'peaks at the beak'. Left, the evolution of a single tornado on May 24, 2016 in Kansas. I discovered the Berg Timer on November 19, 1980. Evidence of this new theory of the planetary positions' effect upon the sun, the Earth, and then other celestial bodies was first published as a periodic newsletter in the 1980's, then here on this website when the internet came along. 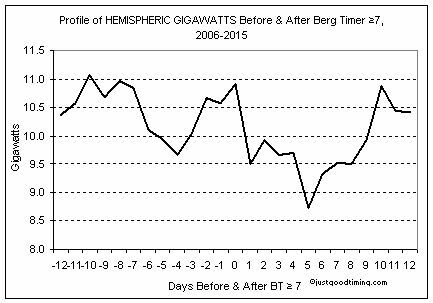 The Berg Timer causes predictable changes in solar activity and Earth's weather, that being that . . .
causes low solar activity, thus high cosmic ray particles penetrating Earth's atmosphere, thus causing cloud formation, and higher precipitation. are longitudinally equidistant from a third planet, with respect to the sun. Being able to forecast solar activity is the cornerstone of BT's capabilities since solar activity is the 'first cause' of Earth's atmospheric circulation and weather. Above is a chart of BT (inverted) and solar flares for 2016-17. Solar activity bottoms when BT is strongest. Solar forecasting is becoming more and more important for our space and electrical power industry. Knowing when solar activity will occur helps us prepare for powerline surges, radiation danger to astronauts and pilots, and damage to satellites. Solar sunspots and flares occur just before and after strong Berg Timer days. Some see it, some don't. That's why I think the profiles are so great because the profile makes it objectively easy to see. Flares bottom when BT is strong, like the 'Eagle' Sunspot profile. Precipitation and other extreme weather is obviously a factor in airline delays and it's confirmed below with the chart of airline late arrivals compared to the Berg Timer. This is featured in the Forecasting Service page which provides the Airline Delay profile enabling you to plan air travel with less possibility of delays. Also above is BT compared to the daily precipitation total of 45 geographically representative U.S. cities and percent of daily United Airlines flights that were "Late" (divided by 2 for charting purposes). Storm systems occur just before and after strong BT days. So it's not surprising to see an increase in late arrivals around high BT. Travel delays can be avoided by using BT to plan travel. Air travel within a week of BT value "7" or higher has a high probability of delay. Ground travelers and outside event planners should consult the Forecasting Page for precise forecast for your area. Accurate weather forecasting is available by finding the profile for your area on the Forecasting Service page and comparing it to the BT Table there. 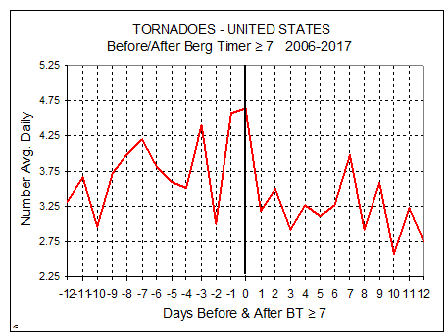 The Tornado/BT chart below for 2016 shows that tornadoes are most likely when BT is strong and peaking, like the Tornado Profile in the Sequence Charts above. That huge BT day in August was the strongest since 1988. This is when the historic flood disaster happened in Lousiana. That was much like the Great Flood of 1927 which also occurred during a very strong BT period. See below that quakes are most likely 8 days before and 6 days after BT >=5 strength (day "0"). The Italy 6.2 and Burma 6.8 quakes on Aug 25, 2016 occurred exactly during the forecasted high day (-8) period for quakes. Then again two more quakes, 5.5 and 6.1 hit Italy on October 27, again, 8 days before "0". Below is the profile of Atlantic Hurricanes. This can greatly improve Caribbean planning for travel, cruises, and shipping in the Caribbean. This correlation was published here in 2008. This new profile confirms it. The best times for travel to avoid hurricanes in the Atlantic and Carribean would be starting 7 days prior to a BT "0" day. At that time you would be able to have a good 8-10 days with a low probability for hurricanes, or at least not getting a hurricane's highest wind periods. See how this profile would have kept you away from Hurricane Matthew in 2016. This would be a great asset for travel agencies or just something everyone refers to in planning their vacation or outside events. One can use this with the Airline Delays profile and be even more confident in your vacation timing. Matthew was a natural progression of strength caused by the Berg Timer. It peaked in strength just one day before the profile forecast. It caused hundreds of deaths in Haiti and much damage throughout the Bahamas and the eastern coast of Florida. South Carolina had massive flooding. BT has proven itself to be a reliable forecasting tool. Electrical storms energize Earth's atmosphere. This electrical power is monitored by the NOAA POES satellites. 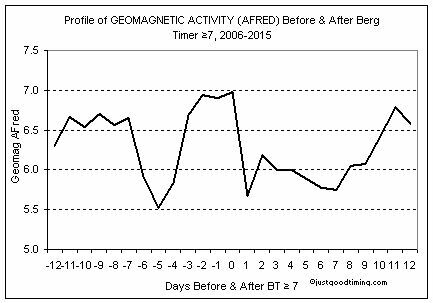 Geomagnetism and Hemispheric Gigawatts can now be forecasted by using these BT profiles. It's a valuable tool for both space and ground electronic engineers and planners. Low periods in BT are indicative of drought in the United States and lows in the world economy. High periods indicate low seismic activity, strong world stock markets, and high precipitation. See the high peaking BT of 2018, the time of a record high stock market. There should be a market decline in 2019 then a rally into 2021 peak. See updated stock market discussion here. Note that as of this writing, BT shows that the economy will bottom during the first year of our new next president (2009). Then the economy will improve for the next year (2010), then a decline for at least the next couple years of the new president (2011, 2012). So our next president may well end his/her presidency at an economic low and be blamed for the very bad economic situation. The government really has little control over the economy. It all depends on the weather and how people behave. One president or one congress does not have the means to control that factor. The economy should be a major sour point for the president who is in office in 2009-2012. But, the president elected in 2012 will see the economy strengthen in 2015, the third year of his/her first/second term. So it goes. If the president elected in 2012 is a first term president, he/she will be re-elected due to a strong economy at the time of re-election in 2016. The Berg Timer's Long-Term Forecast correctly forecasted 2012's low precipitation, high temperatures, low interest rates, La Nina, weak economy, and weak stock market. Hang on, this trend is not substantially broken until 2015. The BT forecast has been published on the home page since 2001. Notice, in the above chart, the strong up BT cycle during the Clinton administration of 1993 through 2000, thus President Clinton's economic success due to the natural cycles. Notice in the chart below the very strong BT during Ronald Reagan's 1981-1988, thus helping him to succeed. Then note the low BT as G.W. Bush was finishing his second term in 2008-9. Thus the economic disaster inherited by President Obama, and for which he is semi-succeeding in blaming G.W. Bush. Then note the bottoming of BT in 2011-12, thus the difficulty President Obama is having with the current economy. The next president will enjoy the favor of presiding over the economic recovery of 2015. If President Obama wins in November, he will take credit for the 2015 recovery. If Governor Romney wins, the economic recovery of 2015 will result in a second term for President Romney. If there were anything the current president could have done to stimulate the economy, don't you think he would have done it by now? He tried with the stimulus but failed. So, to put it all in perspective, except for making some changes in domestic and foreign policies, it's an illusion to think that there is anything a president, dictator, congress, parliament, union, or federal reserve can do to alter the world economic and climatic changes accurately forecasted by the Berg Timer cycle. See below the similarity between the Berg Timer during the Dustbowl 1930's and the 2020's. Thus the forecast for another drought during the 2020's. This first published July 2012. On the current political side, BT hits highs in 2016 and 2018, and so does the economy strengthen and presidential (Trump) approval grow. All because of a strong Berg Timer. There's a dip down of BT in 2019, after the 2018 mid-term elections, so politics should not be affected. Then BT is strong into 2020 and 2021 so it should be a continued strong, but peaking, economy and a second term for President Trump. After 2021 it all falls down until 2028. So during the sliding BT we will have warming temperatures, low precipitation, a weak economy, La Nina (cooling of East Pacific waters), and strong quakes likely. The long ago forecasted 2020's drought is on our doorstep. Farming, water, and hydroelectric power concerns, prepare for the worst. Hope for the best. See pages devoted to each subject at the top of this page for more detailed information and forecasts.